Correct uneven tone and reveal a youthful, perfectly even complexion. This potent targeted skin tone corrector diminishes the look of dark spots using active science and proven botanical ingredients to treat and prevent uneven tone. Patented NeoGlucosamine™ gently exfoliates to break up pigment clusters, while Retinol and a stable form of Vitamin C help reduce the intensity of existing spots. The active ingredient in Turmeric and a special blend of Alpine Plants help prevent new spots from forming. Optical diffusers create an instant, all-over brightness. The result is a brilliant new clarity. "Excess sun exposure over the years can leave your skin with a variety of unwanted sun spots, dark marks, and discolorations on your face, hands and décolletage. When considering skin care that addresses these hyperpigmentation concerns, choose correction products that diminish existing discolorations and help prevent new spots from developing. 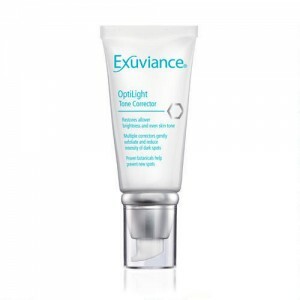 Exuviance OptiLight Tone Corrector utilizes NeoGlucosamine™ Retinol and a stable form of Vitamin C to reduce the intensity of existing dark spots by promoting cell turnover to lightly exfoliate and break up pigment clusters. The OptiLight Tone Corrector is geared towards people that have discoloration from sun damage and aging, but can also be used for someone like me who wants a more even skintone and a brighter look. I honestly don't have terribly uneven skin tone w yet, but I think a big reason I do not is because I use products like this frequently to prevent the problem before it occurs. (And of course staying out of the sun helps) But if you have any type of discolored skin , Exuviance is the product line you should look into. Within a week I had noticed a difference in the color and look of my skin. I can usually tell because of how my foundation makeup applies. It went on much smoother and didn't look caked on or rough in spots. But be careful, I tend to overuse products thinking I will get faster results, but instead I dry out my skin, which is what I did with the OptiLight. I slathered it on, only to notice my skin peeling after 2 weeks. A little goes a long way and you don't want to waste product. Many products promise a lighter, brighter skin after using their product, but Exuviance is one of the only ones that really delivers results in a short amount of time. OptiLight Tone Corrector is available on the Neostrata site for $62. It is also available at Ulta. Very worth the price tag. The Giveaway: One winner will win their own tube of Exuviance OptiLight. To enter, fill out the rafflecopter. Good luck beauties! I could not retrieve the needed info on the widget that wanted me to like bellasbeautyspot on face book. I Love that cream, your wonderful review made me want it now!!! Good Job! !